This man is a journeyman folk singer. He has a beautiful is a gifted songwriter. From the hundreds of songs he sent us, we selected twelve. Each is a gem. I guess we “rediscovered” John in some ways, and we’re just amazed that the world has not yet had the pleasure of experiencing his genius. 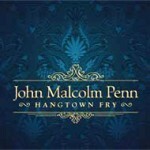 For “Hangtown Fry” John wrote all the songs, sang all the parts, and played all the instruments. Welcome to Blue Night Records, John. We’re very proud you’re with us.